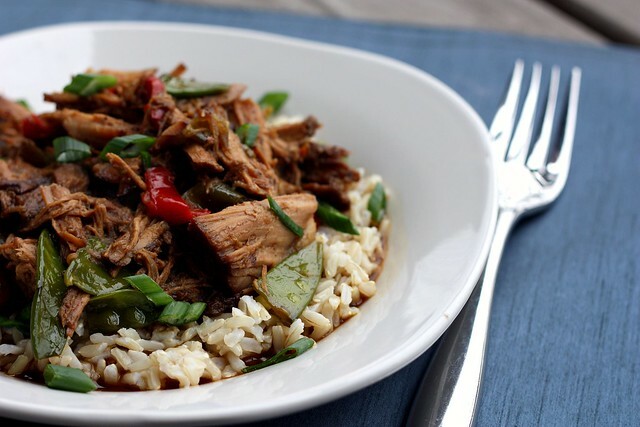 Slowcooker Asian Pork – Elly Says Opa! It’s not often that I see a slowcooker recipe that catches my eye and elicits me to make it almost immediately. I wish I did, really. Crockpot cooking is so convenient but the truth is, there just aren’t a lot of meals I make in mine (though I very much enjoy the ones I do). This recipe, on the other hand, seemed pretty perfect. First of all, it’s shredded meat, which the slowcooker excels at. Secondly, there are no other ingredients added in the beginning—save for the liquid and seasoning—to turn into a mushy pile of ick by the end. And lastly, the ingredients are not only pantry staples, but are extremely flavorful. Oh, and it’s also nice when you’ve taken on entirely too much holiday baking and are too damned tired to cook by dinnertime. We all thought this recipe was great. I can get behind pretty much anything with a garlic/ginger/soy sauce flavor combo. Zachary really enjoyed this and kept asking for “more chicken” (he apparently thinks all shredded meat = chicken). Thank goodness we are past the stage of him refusing meat almost altogether. He also freaking LOVED the snow peas, which is good to know because he has now started turning his nose up at several vegetables. Toddlers, gotta love ’em. I ended up adding a cornstarch slurry at the end to thicken the sauce up for this a bit. You could also dredge the pork in flour and then sear it before adding to the crockpot for a similar effect. I was admittedly hesitant about not searing the pork before throwing it in, since I normally do, but then I remembered another slowcooker pork recipe with fabulous results, despite not searing, so I went with it. I reduced the liquid a bit overall, and also using a center cut roast since it’s leaner (and was on sale for the same price as shoulder). I also threw the snap peas in during the last few minutes, with the cornstarch slurry, because I like them to remain really crisp. As I’ve mentioned, I always use the Saveur method when making brown rice, and it worked out especially well with this because I threw the peppers into the crockpot the same time I threw the rice in to cook, and then I put the snap peas in while the rice was finishing steaming. Guys, I am always SO happy to add a new slowcooker recipe to my repertoire. It gives me the warm fuzzies. Try this one out, I promise you’ll like it (and so does Zachary :-D). In a small bowl, mix together the 5-spice, garlic powder, black pepper, cayenne pepper, and salt. Rub over the pork, wrap rightly, and refrigerate overnight. In the bowl of a slowcooker, mix together the soy sauce, chicken broth, brown sugar, and crushed red pepper until the sugar is dissolved. Add in the ginger and garlic. Place the pork roast into the slowcooker, and place the mushrooms and white parts of the scallions around it. Cook on low for 8-9 hours, or on high for 4 hours. Shred the pork into large pieces. About half an hour before serving, add the pepper strips and continue cooking. During the last 5 minutes, add the snap peas and, if desired, the corn starch slurry. Cook on high, with the lid off, for 5 minutes. Top the pork with the green parts of the scallions before serving.